How Long Can Netflix Keep Outbidding Disney? The broad averages wafted higher Tuesday after being stuck in a holding pattern for more than a week. Although the ascent was gentle for most stocks, the hard-hit FAANGs caught fire, with NFLX leading the pack on a nearly 7% gain. The company announced an 18% rate increase in its most popular plan, which will now cost $13 a month instead of $11. Wall Street loves a company that can make a price increase stick in these very competitive times, and it will allow Netflix to step up the bidding war for A-list talent and content. 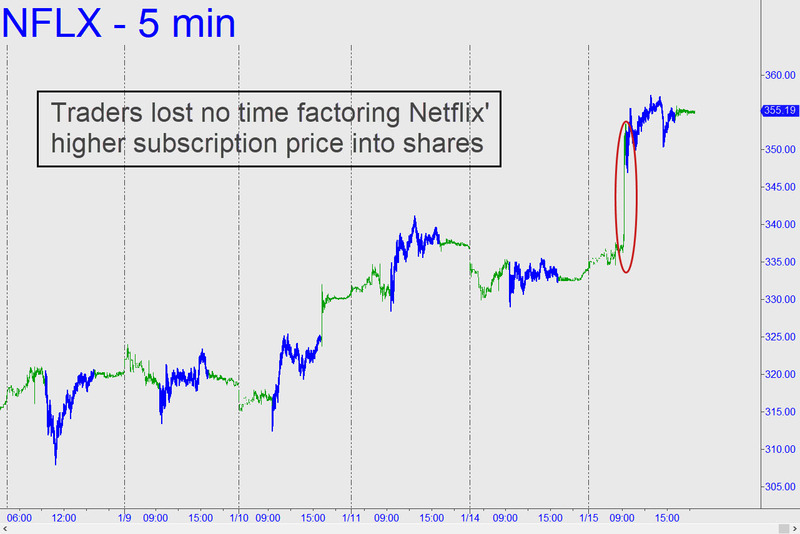 While NFLX was streaking higher, the shares of Disney were falling by almost 2%. The company will have to match Netflix dollar-for-dollar to stay competitive, but it won’t be easy, since Netflix’ pay scale is outrageous. For example, they paid comedian Chris Rock a reported $40 million for two one-hour specials. Nice work if you can get it. But will such extravagant outlays pay off in revenues? The jury is still out, but the suspicion grows that the bidding war has grown too costly to sustain. Money Laundering has been the only road for Hollywood for years, its seems the break down is starting but its very deep. No business such as Hollywood would have lasted with so many failures over the decades and just a few wins. Look for a complete collapse both actors and those that director and support, yes even the big names.